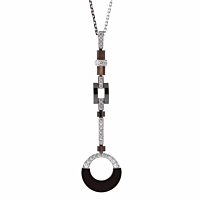 Diamonds, Mother of Pearl, White Gold; Cartier Midnight Elegance for all occasions. 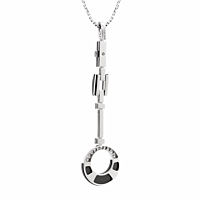 A fabulous Cartier Suite featuring a sparkling and engaging ceramic drop necklace and matching geometric earrings that boast brilliant cut diamonds in 18k white gold, accented with artistic ceramic touches and black mother of pearl. For the fearless, for the unique, only Cartier.